Balcony seats are available by calling the Box Office at 231-941-8082 ext. 201. 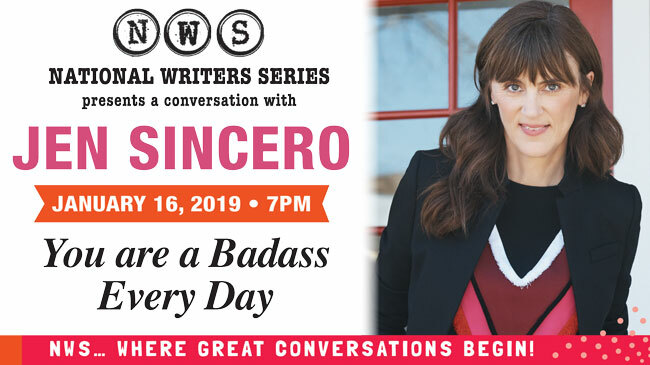 Jen Sincero is a #1 New York Times best-selling author and self-described motivational cattle prod. Jen is a different kind of motivational guru. In her early 40s, she grew tired of living off Taco Bell and transformed herself into a sought-after speaker and bestselling author. She’s changed countless lives and bank accounts! She’s here to talk about her new book, You Are a Badass Every Day. Doors open at 6 pm. Live music, cash bar, Morsels and book signing start at 7pm. This event was made possible by Event Underwriter: TBA; Sustaining Sponsor: Cordia; Season Sponsor: Boomerang Catapult; Grantors: Michigan Council for Arts and Cultural Affairs, National Endowment for the Arts; Media Sponsors: UpNorth Media, Midwest Broadcasting Co., Traverse City Record-Eagle, Northern Express, Interlochen Public Radio, WNMC.